Our travels to Thailand have left us with a serious craving for authentic green curry. 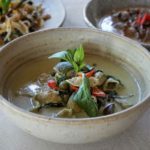 Luckily, New Zealand’s master of Thai cuisine, Chef Che Barrington, has kindly lent us his powerhouse recipe for this iconic Thai spice paste, which you can find here. Now that you’ve whipped up your spice paste, it’s time to turn it into an amazing meal. We’re going to explain how we turn this paste into a version of the classic that we absolutely love – and it’s just so easy. 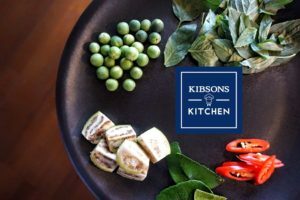 (And again, you can find the ingredients you need for this recipe at our fave, Kibsons). Their produce is super fresh, has a ton of organic options, is fabulous value and they’ll even deliver to your doorstep…click here to find out more. We love to incorporate carrots, red capsicum, baby corn, bamboo shoot...in fact almost any vegetable we have in the fridge has been thrown in on one occasion or another! Just go for what you like. To cook off your spice paste, you’ve got two options. If you’ve just made fresh coconut milk from actual coconuts, then (firstly, if you did this, we SERIOUSLY applaud you) use the heavy cream skimmed from the top of the milk to fry off your spice paste. If you’re using coconut milk from a can, pour a small amount into the pan and add a tablespoon of coconut oil, then use this to cook off the paste to bring those delicious spices out. Once this is nicely brought together and smells fab, add the rest of the tin of coconut milk. Add a cup of chicken stock (or vegetable stock or even water if you want to make a vegan version), the Kaffir lime leaves, a tablespoon of your chosen sugar and a tablespoon of either fish sauce or Healthy Boy Light Soy Sauce. You might want to give this a taste now and tweak to your preferences, as now we’re adding the chicken thighs and this means you can’t taste again until they are fully cooked. Simmer until the chicken thighs are cooked through and then add your vegetables. Cooking time will depend on which veggies you’ve chosen, but 5-10 minutes is all you’ll need. And that’s it. Remove the kaffir lime leaves, add some slices of chili and some Thai basil leaves as a garnish, serve with rice, and enjoy! If you compare coconut products at your supermarket, you’ll instantly find that not all coconut milks/creams are created equal. When we started paying attention to the additives in coconut products, we were horrified! Not only are these additives not what you want to be ingesting, they’re totally unnecessary and can drastically affect the quality of your dish. We’ve thrown out numerous curries due to coconut milk with gums and preservatives completely ruining the flavour and consistency. If you see guar gum, sodium carboy methyl cellulose, xanthan gum, distilled monoglyceride, polysorbate, carrageenan, added sugars or sulfates such as sodium metabisulfite (a bleaching chemical!!! ), put it back! 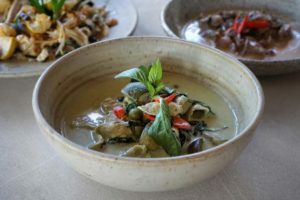 Shot on location at Phuket’s incredible Trisara resort…click here to read our review of Trisara!